They will have great difficulty in leading ordinary lives in the community. Shopping, traveling on buses, buying a meal in a cafe and using a telephone will be difficult, if not impossible, for most of them. They go on to ask: "How do you get to know someone and make friends if you cannot talk to each other?". Early research into language and Down's syndrome concentrated on whether its development in children with Down's syndrome was similar to that in a normal child, only slower, or whether it differed significantly from the usual pattern. These studies, for example Lenneberg (1967), found no evidence to support the idea of deviation from the normal developmental course and confirmed what Lenneberg (1967) described as the "stretched - normal" hypothesis. More recently, however, three circumstances have emerged which may shed some light on the nature of the problem. Firstly, language development in children with Down's syndrome lags behind other areas of their development, particularly cognitive development (Cunningham et al. 1985). Secondly, there is evidence that this gap becomes greater as the children grow older (Coggins & Stoel-Gammon 1982), and thirdly, some aspects of language development itself seem to be more delayed than others, (Rondal 1988, Miller, 1988).These factors provide evidence for the theory that the linguistic system in people with Down's syndrome may be as Rondal (1988) says, truly different. Communication is a broad term, and effective communication requires a number of different skills. It seems from several different studies that the development and use of the structural aspects of language, that is, the system of rules by which we join words together to form phrases and sentences, is a particular problem in Down's syndrome. Structural language (syntax or grammar) includes such things as verb tenses, question forms, pronouns, prepositions and negative constructions, as well as the length and complexity of the sentences. A lack of skills in this area will lead to difficulty in communicating precise meaning to the listener, and consequently cause misunderstandings and frustrations. It is less clear from the research whether the understanding of language (verbal comprehension) is affected to the same extent as production (expressive language). A study by Miller (1988) seems to indicate that, on average, production is more delayed than understanding, while Fowler (1990) suggests that both are affected equally. This present study attempted to look in some detail at the ability of children with Down's syndrome to use syntactical language and compare this with normally developing younger children with the same level of comprehension. A group of 8 children and young people with Down's syndrome was matched for verbal comprehension with 8 normally developing younger children and 5 children and young people with learning difficulties, but not Down's syndrome. This third also matched the Down syndrome group for chronological age. The Down syndrome group of 5 girls and 3 boys had ages ranging from 6 years 6 months to 13 years 6 months (78 - 162 months) with a mean age of 11 years 6 months (138 months). 7 of the children were aged between 10 years 4 months and 13 years 6 months, while 1 child was rather younger, at 6 years 6 months. For the normally developing group, 8 children attending a local pre-school class were chosen, 5 girls and 3 boys, aged from 3 years 4 months to 4.00 years (40 - 48 months) with a mean of 3 years 9 months (45 months). The third group had only 5 subjects, 3 girls and 2 boys because in many cases there were other problems which affected communication, for example autism, cerebral palsy, severe behavior problems or extremely short attention span, making them unsuitable for the study. In this group the ages for 4 of the subjects ranged from 11 years 4 months to 13 years 10 months, while 1 younger child was matched for age with the younger child in the group with Down's syndrome. Her age was 6 years 9 months and the mean age for the group was 11 years 9 months. Initially, all the children's understanding of language was assessed using Verbal Comprehension Scale A of the Reynell Developmental Language Scales, 2nd Revision (Reynell and Huntley, 1985). The verbal comprehension scores ranged from 3 years 3 months to 4 years 11 months (39 - 59 months) with a mean of 4 years 1 month (49 months) for the pre-school children (Group A), 3 years 2 months to 4 years 11 months (38 - 59 months) with a mean of 4 years 3 months (51 months) for the Down syndrome children and 3 years 3 months to 4 years 11 months (39 - 59 months) for the non- Down syndrome group with learning difficulties (Group C). These figures are displayed in Table 1. Although it would have been ideal to have collected spontaneous samples of the children's language for analysis, not only was this unrealistic within the time available, but it would have presented particular problems with the Down syndrome group because of their poor intelligibility. Bray and Woolnough (1988) found that intelligibility was very dependent on the listener's knowledge of the context. STASS (South Tyneside Assessment of Syntactic Structures, Armstrong and Ainley 1988) is designed to encourage children to produce a range of linguistic structures, using pictures which the children found attractive and stimulating. The language samples obtained are then analysed using the principles of LARSP ( Language Assessment Remediation Screening Procedure; Crystal, Garman and Fletcher 1976), Stages I to IV, where Stage I structures are the simplest and Stage IV the most complex. STASS also records a range of auxiliary verbs (e.g. is, can, will used with another verb, as in "she is crying"), prepositions (in, under, behind, etc. ), and pronouns (he, she, them, etc.). The children's STASS assessments were video-taped and analysed later, with the help of additional notes taken at the time. Any spontaneous comments were also recorded for analysis. The transcribed utterances were analysed into clause, phrase, and word structures and expansions, following LARSP procedures. In order to obtain a numerical score so that the performances of the three groups could be compared, the number of target structures at each of the 4 stages within the STASS assessment was calculated and each child's score was presented as a percentage of the possible target structures. A mean percentage score was then obtained for each group. The mean percentage scores for each group at each of the stages, together with an overall score for all the stages combined were then compared for statistical significance using two procedures. A Kruskall - Wallis analysis of variance compared Groups A, B and C, while a Mann - Whitney U - Wilcoxon Rank test compared pairs of groups (A/B, B/C, A/C). Table 2 shows the mean percentage of structures used per group at each stage. The children with Down syndrome (Group B) used, on average, a higher number of structures at Stages I and II than either of the other 2 groups, and this was statistically significant when compared with the pre-school children (Group A). At Stages III and IV, the children with Down syndrome used fewer structures than either of the other groups. In total, the number of structures used throughout the assessment by each group was quite similar, with the largest number used by Group C (learning difficulties), while Groups A and B differed by only 1.75%. The auxiliary verbs, prepositions and pronouns used by each child were recorded and a percentage of the target calculated and averaged for the groups. The Kruskall- Wallis and Mann Whitney statistical tests were carried out as above. These scores are set out in Table 3. Seven auxiliary verbs, 7 prepositions and 13 pronouns are targeted in the STASS assessment. 2 children in Group A used 6 of the verbs, and although the highest score in both Groups B and C was 5, when the mean scores for this section were calculated, the children with Down syndrome used significantly fewer auxiliary verbs than both of the others in the Kruskall- Wallis comparison and significantly fewer than the pre-school children using the Mann Whitney. With prepositions, the performance of the pre-school children and those with Down syndrome was identical, with the children with learning difficulties having a slightly, but not significantly, higher average. Overall there was no real disparity between the groups in the use of prepositions. Of the 13 possible pronouns, only 2 children in Group B used 8, compared with Group A where only 2 children used fewer than 8, with 2 children using 11 out of 13. Only 1 child in Group C used fewer than 8 pronouns while 2 of them used 10. The mean totals for Groups A and C were very similar, while Group B used significantly fewer pronouns in all the statistical comparisons. Probably the most interesting finding of this study is apparent when the developmental progression of the 3 groups, from Stage I to Stage IV is compared. Two of the groups have very similar profiles, while the third group differs markedly. As 2 groups were made up of children of similar ages, all with learning difficulties, it might have been expected that these groups would have similar linguistic skills. This, however, did not prove to be the case. Groups A and C, the normally developing children aged 3 and 4 years and the group with learning difficulties but not Down syndrome had very similar profiles, with the highest number of structures used at Stage III. 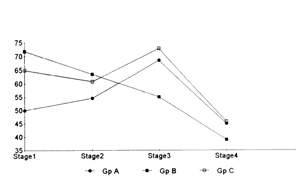 Group B, on the other hand, the children with Down syndrome, had their highest scores at Stage I and steadily decreased at each stage thereafter, as illustrated in Figure 1. This demonstrates that the linguistic output of the children with Down syndrome was significantly less mature than either their non- Down syndrome peers or younger normal children with the same level of comprehension. It also indicates that this is a problem specifically related to expressive language, rather than affecting comprehension equally. Further differences between the groups emerge in the comparison of auxiliary verbs, prepositions and pronouns. As seen in Figure 2, both with auxiliary verbs and pronouns, it is, once again, the children with Down syndrome who do significantly less well than the other 2 groups. However, there is a curious contrast to this with prepositions. Here, their mean score is identical to that of the younger group, with the other children with learning difficulties scoring slightly, but not significantly higher. It is interesting to speculate on why the Down syndrome group perform comparatively better with prepositions. One possible explanation, without anything other than personal experience and observation to support it, is that there may be more emphasis in schools and therapy sessions on teaching prepositions than pronouns or auxiliary verbs. While the effect of using fewer pronouns may be that language is clumsier and less refined, it is still possible to communicate effectively by using nouns instead. The lack of auxiliary verbs, on the other hand, will have a profound effect on the ability to convey information verbally. Auxiliary verbs are needed to indicate the future tense (he's going to jump), many aspects of the past tense (he was jumping) and to form complex clauses. When Miller (1987, p 245) says: "Apparently, individuals with Down syndrome fail to transcend time and space in their productive language, talking instead about objects and events immediately present both in time and space", this could be explained, in part at least, by a deficit in the acquisition and use of auxiliary verbs. Explanations put forward for the language problems of people with Down syndrome fall roughly into two groups: those citing social and environmental factors and those suggesting a specific neurological processing deficit, interfering with the acquisition of language. There are many studies with evidence to substantiate both theories, but perhaps the most likely explanation is that both social and environmental influences and language processing difficulties play a part and together have a compounding effect. What implications does this study have for intervention and teaching? Firstly, there are indications that changing the ways in which adults interact with young children with Down syndrome could have a positive effect (Jones 1977, Smith et al. 1988), for example by encouraging parents and teachers to allow more opportunities for the child to initiate communication, so the child becomes more pro-active and less reactive communicatively. Also, developing strategies of expanding the child's utterances rather than repeating them back. This involves an element of risk- taking because of the poor intelligibility, but combined with greater opportunities for initiating language would allow for more experimentation with language, as happens in normal development. Secondly, if teaching strategies are to be effective, they need to build on the strengths and minimize the weaknesses. Perhaps in Down syndrome this means using visual channels as much as possible to augment and help overcome the auditory processing deficits. Examples of this would be the use of the written word, visual symbols (e.g. Rebus) and other visual media such as signing systems, not only as an aid to understanding but also for "cueing" new expressive language structures. Maybe language teaching needs to be particularly targeted at the area of syntactic skills. Some of this is happening already, of course, but these interventions need to be carefully evaluated to show which particular aspects have the most value. If the children with Down syndrome in this study did do as well as the other groups in the use of prepositions because these are more often specifically taught, then it would seem logical that the same would apply to other verbal concepts. Finally, consideration should be given to teaching them to use strategies to supplement their spoken language. Both Bray and Woolnough (1988) and Buckley and Sacks (1987) describe the lack of ability adolescents with Down syndrome have to deal with situations where they are not understood even by their families. Both studies found that some youngsters successfully used signing to overcome difficulties. As most people with Down syndrome learn to sign easily, there seems some value in continuing to use it even after verbal communication is well established, to resort to in times of difficulty. Role play and other similar techniques could be used to give older children and adults experience of using different repair strategies when misunderstandings occur. One thing is certain, that the problems people with Down syndrome have in communicating verbally will not go away, but possibly the more that is known about the nature of the problems, the more effective interventions will become. Armstrong, S & Ainley, M. (1988) South Tyneside Assessment of Syntactic Structures. STASS Publications. Bray, M. & Woolnough, L.(1988) The language skills of children with Down syndrome aged 12 to 16 years. Child Language Teaching and Therapy 4(3), 311- 324. Buckley, S. & Sacks, B. (1987) The Adolescent with Down Syndrome. Portsmouth Down Syndrome Trust. Coggins, T.E. & Stoel-Gammon, C. (1982) Clarification strategies used by four Down syndrome children for maintaining normal conversational interaction. Education and Training of the Mentally Retarded, 17, 65-67. 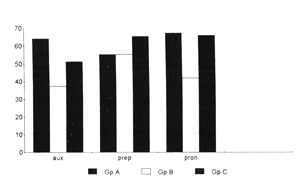 Crystal, D., Garman, M. & Fletcher, P. (1976) The Grammatical Analysis of Language Disability. Arnold. Cunningham, C.C., Glenn, S.M., Wilkinson, P. & Sloper, P. (1985) Mental ability, symbolic play and receptive and expressive language ability of young children with Down syndrome. Journal of Child Psychiatry, 26(2), 255-265. Fowler, A.E. (1990) Language Abilities in Children with Down syndrome; Evidence for a Specific Syntactic Delay. In Ciccetti & Beeghly (Eds) Children with Down syndrome. A Developmental Perspective. Cambridge University Press. Jones, O.H.M. (1977) Mother child communication with pre-linguistic Down syndrome and normal infants. In: Studies in Mother-Infant Interaction, Academic Press, New York. Lenneberg, E.H. (1967) Biological Foundations of Language Wiley, New York. Miller, J.F. (1987) Language and Communication Characteristics of Children with Down syndrome. In Pueschel, S., Tingey, C., Rynders, J.E., Crocker, A.C. & Crutcher, D.M. (Eds) New Perspectives on Down Syndrome, Paul Brooks Pub & Co.
Reynell, J., & Huntley, M. (1985) Reynell Developmental Language Scales, 2nd Revision NFER-Nelson. Rondal, J. (1988) Down syndrome. In Bishop, D. & Mogford, K. (Eds) Language Development in Exceptional Circumstances. Churchill Livingstone.